Perhaps the greatest contribution Howls Of Ebb make is to the topic of distortion in death metal. By largely taking the in-your-face but ultimately synthetic trickery offered by modern pedal and processor technology out of the picture for a far more subdued, even tinny sound, Howls Of Ebb let their unsettling music speak for itself, and in the process stand out from a number of same-sounding bands doing the rounds. Bass drums like the frantic fluttering of paper hearts in a sultry air and screeching, scurrying, pitch-shifting guitars are frequently found in the more death metal sections on Vigils Of The 3rd Eye. These are the times when the band is captivating and on unusual territory for a death metal band, creating their own unique take on the genre as filtered through a lens of early Morbid Angel and the experimentation of Gorguts on Obscura. 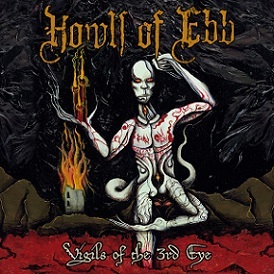 But Howls Of Ebb are also obliged to live up to their atmospheric, mystical qualifications by introducing several “post” influences borrowed from Mayhem‘s work on Ordo Ad Chao and Deathspell Omega‘s tinkerings since Kenose. Songwriters in control of their vision as they are, Howls Of Ebb don’t let these peripheral pursuits consume the more intentful part of their music, which indeed is riff-based, forward-moving death metal, and come away with an album rich in fiery peaks and simmering comedowns. Vocals are cadaverous, phlegm-filled rasps administered not without a sense of rhythm and lilt over songs that entrench themselves into the listener’s memory with repeated listens. Vigils Of The 3rd Eye is a strange album; like Le Grande Oeuvre by French band Situs Magus, it carries with it an impersonal, sterile vibe that doesn’t allow emotional involvement on any level. But like the two-headed goat at your local carnival freakshow, it draws you into its foul tent and keeps you hooked for its length. This entry was posted in Uncategorized and tagged gorguts, Howls Of Ebb, Le Grande Oeuvre, morbid angel, obscura, Situs Magus, Vigils Of The 3rd Eye. Bookmark the permalink.